With more than $1 billion in annual retail sales, popcorn is not only one of the hottest growing snack foods in America; it’s becoming a global phenomenon. Popcorn fits into the better-for-you snack trend as a low-calorie food with a myriad of flavoring possibilities. Food processors from around the world rely on AC Horn Manufacturing to build, ship and service the equipment they need to take advantage of this snack market opportunity. Horn owns the best reputation for quality and reliability, serving medium to large-sized popcorn processors. This market concentration on industrial-sized snack processors gives Horn an unparalleled depth of experience to understand the special requirements and needs of this unique customer base. When we sell a piece of equipment, it marks the beginning of a business relationship, not the end of a transaction. We believe in superior service and swift response to customer requests from planning, through construction and shipping and for years following installation. Horn industrial poppers are built with longevity in mind. Robust and durable, each piece has an anticipated lifespan of at least 20 years. Every piece of Horn equipment is designed for optimal plant safety and sanitation, ease of operation and minimal maintenance. In 1962 Manley manufactured its first Uniflow Design popcorn popper. Since that time, and through many improvements, AC Horn Manufacturing has been a leader in high capacity, continuous popcorn production systems. We believe there is no higher quality popping system manufactured or designed on the market today. The Platinum Series offers the latest PLC controls and the highest quality components available. We manufacture a high-capacity, continuous popper that operates automatically from one convenient point of control. With a forced air combustion system, internal laminar baffling, precise burner controls and extra insulation, the Platinum Series Poppers provide all the features you need in your equipment. In addition, you can expect low operating costs and minimal maintenance requirements. Regardless of the type of popcorn you are popping, we confidently guarantee superior capacities and popping ratios with our poppers. At AC Horn Manufacturing, we build quality into our entire process. Our goal for the M205 Series Cooker/Coaters is to enable you to create perfect caramel corn with every batch, for years of trouble-free operations. We carefully engineered these precision-built machines to do just that, giving you decades of superior performance and durability. Caramel corn, peanut brittle and other caramel-coated products can be manufactured at high volume capacities ranging from 300 to 1,000 lbs/hr (depending upon recipe and coating ratio). 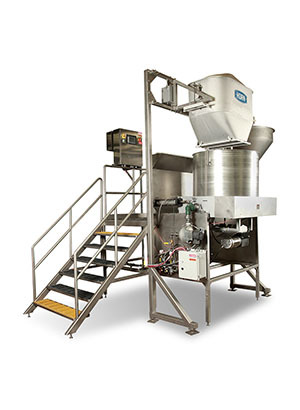 Program design features and operating simplicity elevated our machine to the preferred choice among worldwide leaders in the snack food industry. The Cooker/Coaters are extremely accurate and easy to operate, giving operators the ability to precisely control manufacturing variables for the best product. At AC Horn Manufacturing we build quality into our entire process. Our goal for the M205 Series Cooker/Coaters is to enable you to create perfect caramel corn with every batch, for years of trouble-free operations. We carefully engineered these precision built machines to do just that, giving you decades of superior performance and durability. Caramel corn, peanut brittle and other caramel coated products can be manufactured at capacities ranging from 300 to 1,000 lbs/hr (depending upon recipe and coating ratio). 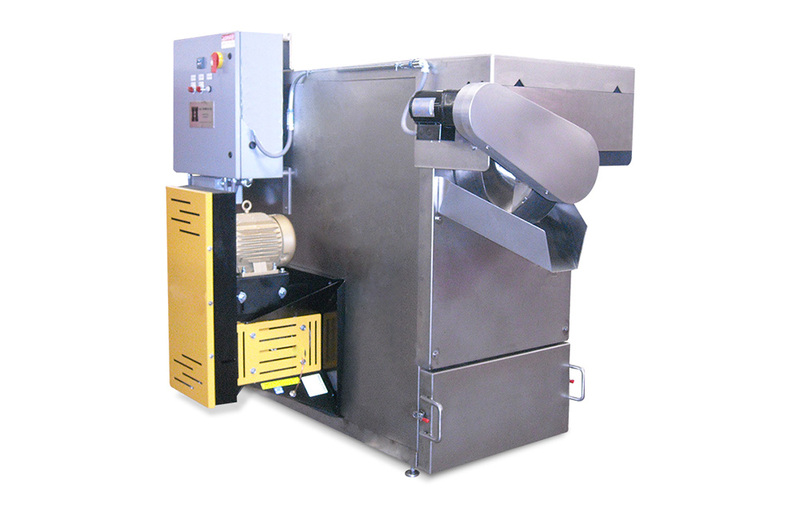 Optional features offer operators the opportunity to produce kettle corn at capacities of 400 to 1,000 lbs/hr. 7 M319 Slurry Pump System Mixes the slurry ingredients before transferring to the M205 kettle through a pump system. Kettles can be self-contained, electric or hemispheric, steam-heated kettles. Capacities for this system are based upon input temperature of 185 F. Actual final output depends upon recipe and customer process. A. C. Horn & Company will work diligently with you to meet your company's precise processing needs. 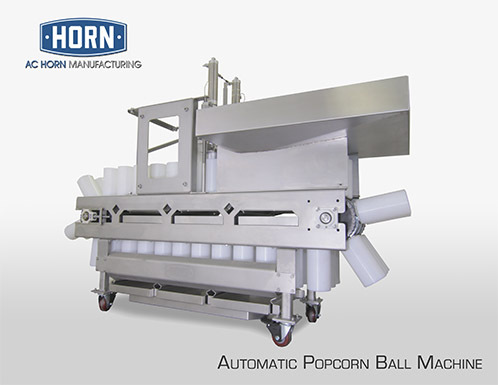 The M220 Robopop from AC Horn uses hot air in a vortex to pop corn – up to 220 lbs per hour! The M220 is an electric dry popper that features patented Vortex hot air flow technology. The innovative M220 ensures that kernels are evenly spread over the parabolic bowl in the chamber. The Vortex air stream provides rapid, uniform heating -- as the corn is in a continuous rotation around the axis of the bowl -- resulting in a superior capacity and popping ratio. After corn is popped, the Vortex air flow inside the chamber immediately blows popped corn away from the hot air – maintaining great popcorn taste. The AC Horn M360 offers high-volume, consistent production in a single, gas-heated cooker/coater. This all-in-one machine is designed to deliver perfect batches of your sweet popcorn products. 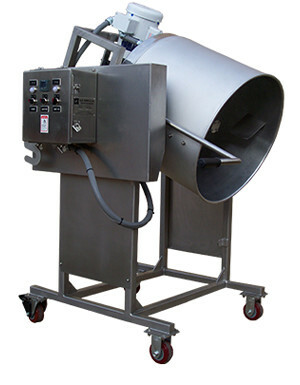 The M360 heats and coats up to 325 pounds of popcorn per hour (based on a 4 to 1 ratio of caramel). The easy-to-operate touch screen controls allow trouble-free recipe programming, precise temperature regulation and product monitoring. 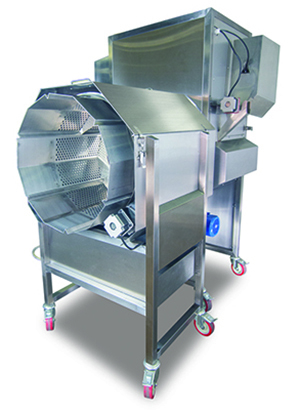 The unique design of the internal agitator helps ensure that all popcorn is evenly coated. An electric dump mechanism enables simpler and less physically-demanding operation. For producers ready for more automation, the M360 is designed as part of a modular, scalable system. Additional kettles and other components can be added to automate the system as your production needs grow. 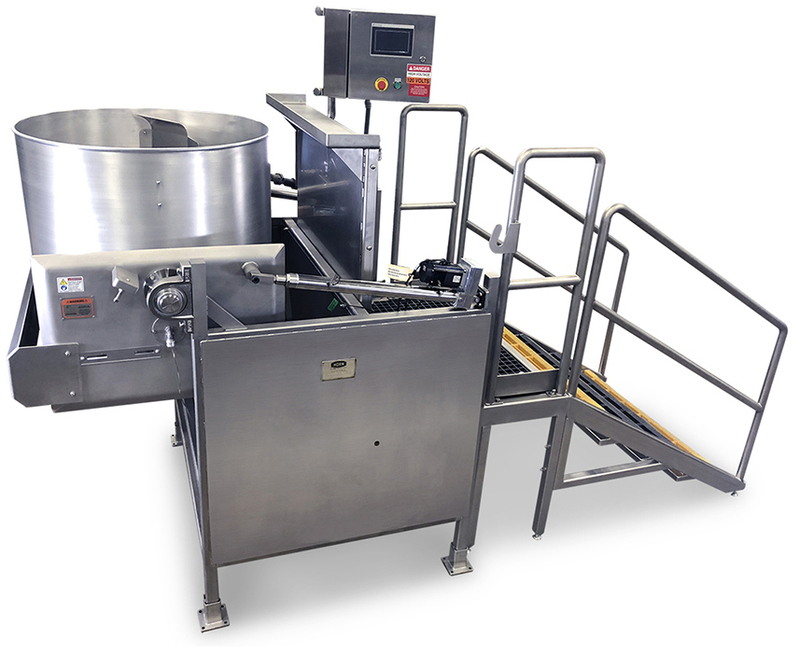 Our M360 Cooker/Coater line is an example of how AC Horn strives to serve every customer’s needs, as the M360 line is custom-configured to fit your space and production requirements. Although the M360 is an affordable option as a stand-alone cooker/coater, we designed this line for companies producing sweet popcorn products with small batch machines, that want to make the jump to more automated systems. The M360 line is a modular, scalable system. Components can be added to automate your process as production needs grow. Whatever your specific production needs with popcorn snacks, we can configure an M360 line that is right for you. Cooling & Separating: Coated Popcorn discharges onto the collection conveyor. It is spread and transferred into the cooler separator where the product is brought to ambient temperature.